RoundLock Padlock Discounts Apply ! 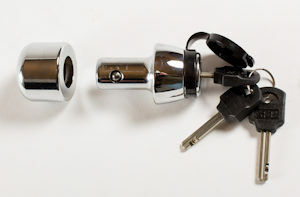 Our custom-made SecurityForBikes RL21 RoundLock super-compact padlock. Sold Secure Motorcycle Gold/Quad & ATV Gold/Bicycle Gold/Motor Scooter Gold approved with any appropriately-approved chain and also on its own (e.g. as a disc lock). The RoundLock is lighter and a lot more compact than the Squire SS65CS whilst offering similar security at a much cheaper price. Note that this is a 2-part lock where the top section comes out completely and is then re-inserted sideways through the chain and into the female lock receiver. It may be slightly harder to use than the SS65CS as a result (although you typically need 2 hands to fit that lock to a chain as well). The lock body is 40mm diameter and in the locked position it measures approximately 77mm long overall. That excludes the the plastic cap at approximately 6mm thick. Very compact and a perfect partner for Protector 16mm chains at a great price! Not suitable for our 19mm chain unless the optional extra RL21A socket is also purchased and that is used in place of the standard RL21 socket. The RL21 can sometimes be used with our Protector 13mm chains - it's a close fit and the manufacturing tolerance on the chains can make-or-break the idea of the combination. Check to see if we have the corresponding Package Deal available - if it shows as available to order then we have a batch of chain that fits the RoundLock! This lock can also be used as a motorcycle disc lock - Check that you have a suitable opening that will take the 21mm diameter shackle in your brake disc or disc carrier. You can then use this with a chain when at home and as a disc lock when out and about. The RoundLock is generally not suitable for 11mm (or, sometimes, 13mm) chains or for use with hasps, padbars, etc. This is a lovely lock. Small in size, but not in security as the shackle is thick and out of the reach of the thief. Bought to fit another brand of 16mm chain (it does) to remove the weak-link padlock I had. Ace!